Severin Films’ Loss Is A “B” Fan’s BIG Gain | "DESTROY ALL FANBOYS!" Attention Severin fans! Our rights are expiring for Psychomania (DVD), The Baby (DVD & Blu-ray), Bloody Birthday (DVD & Blu-ray), Horror Express (Blu-ray/DVD combo) and House of Seven Corpses (Blu-ray/DVD combo) very soon so we need to do a little bit of house cleaning and clear as much product out as possible. For this listing, you can get all FIVE (5) of these titles for $30. Please indicate if you prefer DVD or Blu-ray (where applicable) in the comments section upon checkout. We also have another listing available where you can pick THREE (3) titles for $20, or you can buy them individually for $10. That’s it! Easy as can be! Now go buy one of these titles and backfill your Severin catalog. Be sure to tell a friend. Tell a non-friend. Tell your grandmother. Tell your neighbor’s dog. Spread the word and help us clear out the old to make room for lots of new coming up. Retail therapy works best when you get what you want and can spread the love all over the place. Now go buy something gift-y for yourself or a few friends. 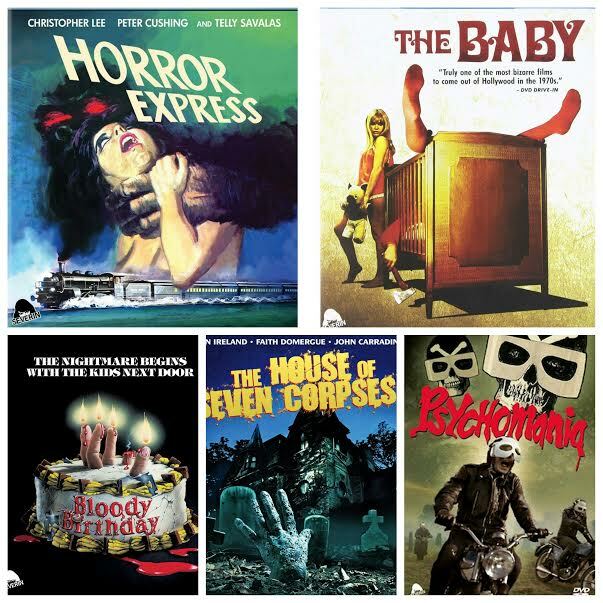 This entry was posted in 2016, Commentary, DAF, Features, Humor, Updates and tagged Bloody Birthday, BUY THESE FILMS!, DEALS, Exploitation Films, Gifts, Holiday Gift Guide 2016, Horror, Horror Express, Horror Films, House of Seven Corpses, Movies, Psychomania, Sales!, Severin Films, The Baby by geelw. Bookmark the permalink.